Atlantic salmon and brown trout numbers have improved in the rivers Lugg and Arrow. The rivers Arrow and Lugg in Powys, UK, suffered a sharp drop in Atlantic salmon numbers in the 1980s and 90s because of a series of man-made weirs which prevented the fish from migrating. This has changed in 2003 when fish passes had been built making it possible for the salmon to travel upstream. Recent surveys on numbers of young fish throughout the rivers, carried out by the Wye and Usk Foundation, showed encouraging results. The estimates show that salmon and brown trout numbers have improved and that the Lugg and Arrow catchment could add a further 3,000 to 4,000 fish to the Wye salmon run. Dr Stephen Marsh-Smith, executive director of the Wye and Usk Foundation, which worked on the project with the Environment Agency (now Natural Resources Wales), said: "It's taken a decade to build these fish passes. The paperwork has been as big a task as actually building them. 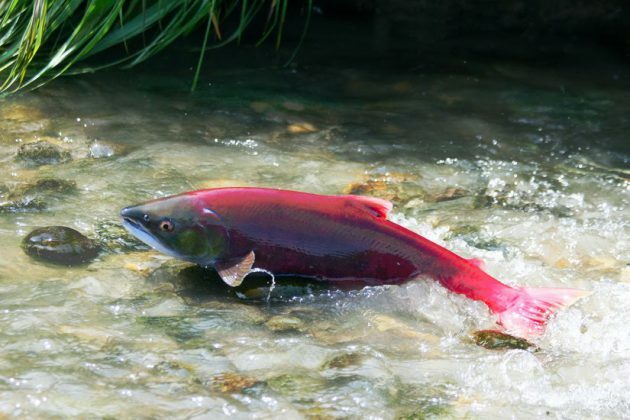 "However, once built, they will last for years, ensuring continuity of salmon and trout populations for decades to come. "We would like to thank all the individuals and organisations that help fund the work, especially the Lugg and Arrow Fisheries Association."